Want free Samsung Galaxy smartphone? Enter the Sprite Summer Instant Win Game Sweepstakes at Sprite.com/summer for your chance to win Pocket DJ Mixer, $10 Music E-Gift Card, Portable Bluetooth Speaker, Headphones, Smartphone and much more. Visit this link:www.sprite.com/summer and log in to your Account. Follow the online instructions to enter or scan a unique code located under the product cap or located on the product packaging of participating Sprite 20 fl. oz. products. Claim your Instant Win Game play from the “My Rewards” tab, and you will be notified through your email address that you provided if you become winner of one of the Instant Win prizes. Prizes: “Instant Win Prizes” (68) A pocket DJ mixer. Approximate Retail Value (“ARV”): $100, (68) A portable Bluetooth speaker. ARV: $100, (68) A pair of earphones/headphones. ARV: $100, (450) A $25 GameStop e-gift card. ARV: $25, (450) A $25 Foot Locker e-gift card. ARV: $25, (516) A $10 iTunes gift card. 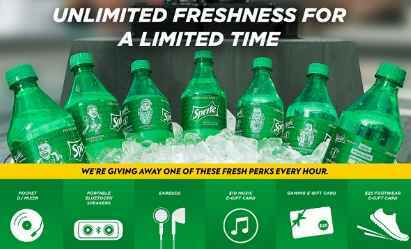 When To Enter: The Sprite Summer Instant Win Game entry begins at 12:00 p.m. Eastern Time (“ET”), June 25, 2018 and ends at 11:59 p.m. ET, August 31, 2018.